This is Maddie’s Color-wheel Quilt (click the image above to see this in full size). Isn’t my niece the cutest thing you’ve ever seen? 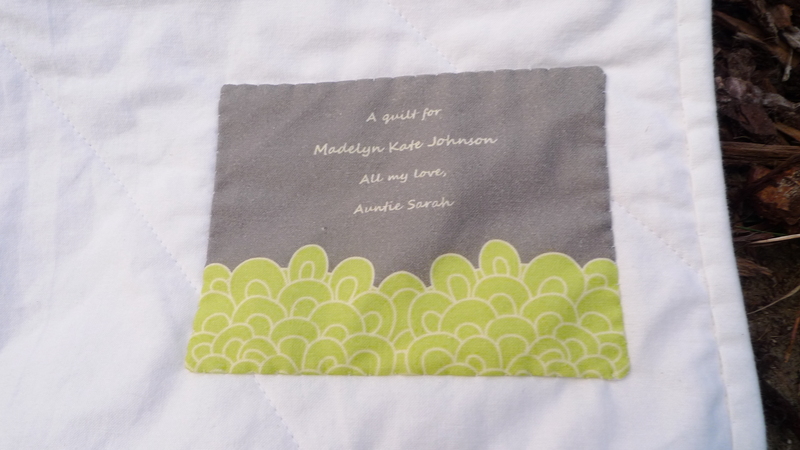 I designed and Spoonflower printed this little tag so Maddie will always know that her Auntie made this quilt just for her. Purlsoho.com provided the lovely bundle of spectrum fabrics (fat-eights). I never would have been able to come up with such a pretty range of fabrics! The bundle provides enough fabric to make 2 colorwheel quilts, so I think it’s well worth the money. 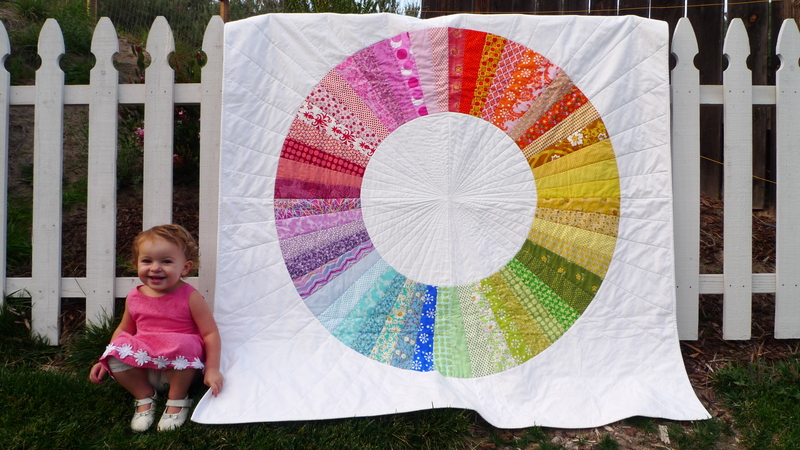 Pattern: Colorwheel Quilt from Last Minute Patchwork and Gifts by Joelle Hoverson. I highly recommend this pattern, trust me, it’s easy!!! I LOVE this quilt! You are a prolific quilter.! And yes, Madelyn is the cutest little girl in the world. They are too cute! I love my sweet Maddie and the quilt is adorable. Thanks so much for sharing your quilt with us! You did such a fantastic job! I want that quilt for myself! Love it. This is SO beautiful! What a lucky niece you have! That quilt is beyond gorgeous. And those labels … must have labels like that. Beautiful! The colours are perfect! Maddie is gorgeous too! And fyi- Maddie loves this quilt~She loves to name all the colors and is always pointing something out in it- airplanes, polka dots, birds- she loves it all! beautiful quilt! i have this book & marked this pattern as a must make one day! She looks so thrilled to have her new quilt! 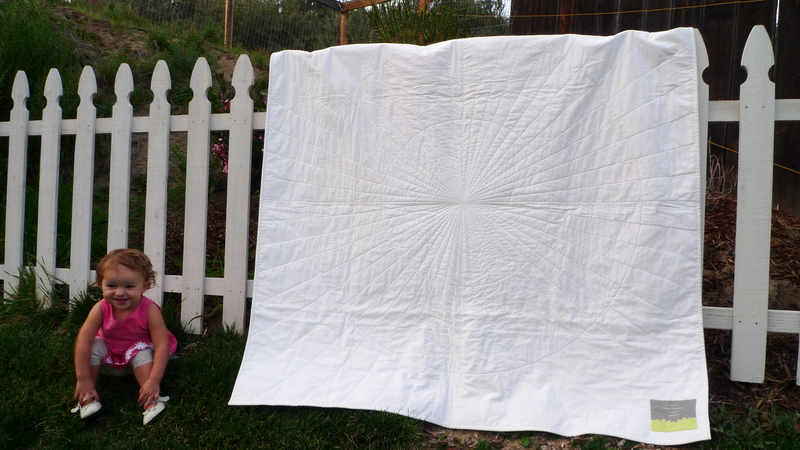 I can’t believe how beautiful it is – and the quilting looks like perfection! Such a pretty quilt!